Carlotta was originally launched as “The Solway” at the W.H. Halford yard in Gloucester at the head of the Bristol Channel. 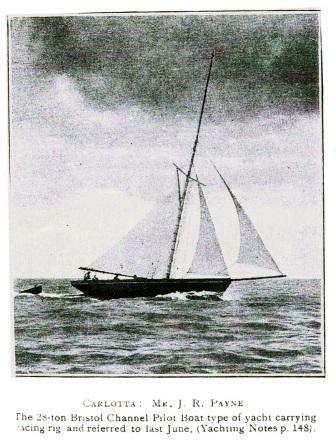 Halford built at least two other Bristol Channel pilot cutters on similar lines to the Solway: including the “Britannia”, and the “St.Bee’s”. Carlotta is the sole remaining example from the Halford’s yard. Halford’s boats differed from other pilot boats by having several unique features. The bowsprits were not offset, instead being placed on the centre-line of the vessel. Also, they featured ‘Valkyrie’ bows – straight stems with substantial rake. And in addition to the internal ballast, an external iron keel was fitted. Some of Carlotta’s scantlings are significantly heavier than comparably sized pilot boats. Her framing is 6 inches wide with only 6 inches in between each frame and – in addition to the 3″ x 8″ bilge clamp – she sports two 3″ x 8″ shelf clamps, one on top of the other, the full run of the vessel. Other than these items, she is planked of pitch pine and elm with an elm keel and iron fastened just as her sister ships, and is fitted out on deck and below in a similar fashion as well . Carlotta’s construction was monitored closely by a retired Pilot. When completed she was put to work in Maryport and Whitehaven as a fisheries police boat. In 1907 she was replaced by a steam driven vessel and as a result sold off as a yacht. Carlotta has been owned and sailed by pilots, princesses, viscounts, lords, criminals, Churchill’s cousin, an illegitimate line of the royal family, and one-eyed Canadians. Her history includes a daring escape from Guernsey in World War II. She’s been laid over by hurricane force winds until the mast trucks were almost hitting the water, she’s raced successfully against Twelve-metres, the British Army Training Manual was written on board, and a porpoise once swam across her foredeck in a Scottish gale! She’s been dropped four feet from a travel lift, towed by rowboat completely around Texada Island, made ocean passages averaging 180-mile days, and been engineless for the past forty years. In the 1970’s she fell over on her beaching legs, smashing her port side frames in. 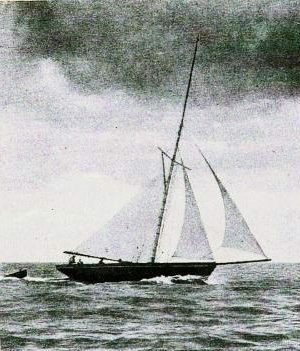 That was almost the end of her, but she was rescued by Canadian Peter Heiberg who put her right again and sailed her to the Caribbean where he cleaned up in the classic race circuit before setting off to Hawaii and then home to British Columbia. Now Carlotta is once again sailing after an extensive five year refit by the Mohan family and is ready for many more years of fantastic adventures.